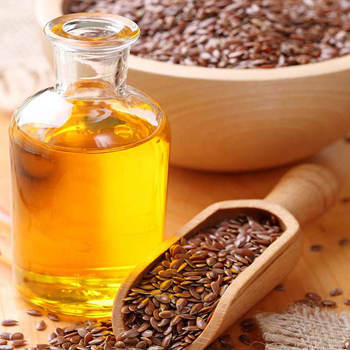 Linseed oil is a much less demanded product than Sunflower oil, which is more common in the diet of Russian consumers. Nevertheless, its popularity is growing every year. This is due to the fact that more and more people are eager to consume and use natural and healthy products for their cooking. To produce Linseed oil, the seeds of flax, which is grown for this purpose on an industrial scale, are used. The technology of the cold-press allows retaining all the medicinal and wholesome qualities of the final product, as well as Vitamins important for the body, saturated and polyunsaturated fatty acids. Their quantity within the composition of Linseed oil makes it one of the doubtless healthy leaders among all other types of vegetable oils. Oil from flax seeds is rich in the content of such elements as Omega-3 and Omega-6 polyunsaturated fatty acids. The introduction of flaxseed oil to the diet and regular intake is recommended by doctors to reduce cholesterol, as well as to increase blood vessel elasticity. According to the experts, Linseed oil is a natural elixir of youth. Linseed oil as a food ingredient can be used in pure form in salad dressings or for seasoning other dishes, as well as for preparing wholesome desserts with fruits, honey or syrup. It is very popular in cosmetology, as it is used for the preparation of products that positively affect the health and condition of the skin, hair and nails. We offer you high quality Linseed oil. In its production, we select only the best raw flax, grown in eco-friendly conditions within agro-industrial complexes in the south of Russia. • is bottled into ecologically safe and environmentally friendly receptacles.